But before we get to that story, let’s start with visiting Spokane, the largest city in Eastern Washington, and the second largest in the state. 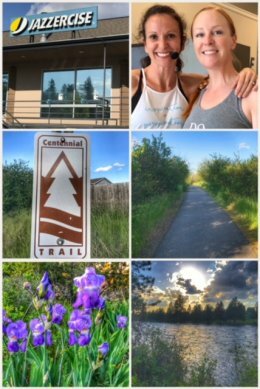 We hiked the fabulous Centennial River Trail, a 37-mile paved recreational trail. But, more importantly, thanks to Jenny’s friendship with Erica Demateis, we got to visit (and dance and sweat) at Erica’s Jazzercise studio. Spokane is a city of many things, including crazy streets and interstate exits — and is known at the Lilac City. We see Spokane as the potential hub for our activities and work (including Whitworth and Gonzaga Universities for Ran), but living in one of the spokes outside of the city. While in eastern Washington, we took a side trip up to Ferry County’s main town, Republic, which holds a special memory for Jen and Ran, as that’s where we first met in person. While the coffee shop where we first met no longer exists, we were able to explore the town and surrounding Colville National Forest… as well as walking the very fun Ferry County Rail-Trail, a 25-mile non-motorized trail that starts just northeast of the town and continues up all the way to the Canadian border. 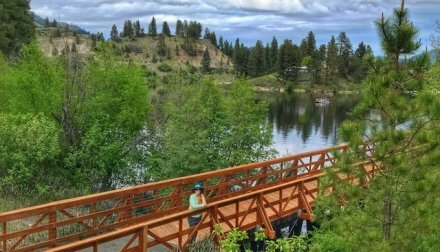 We spent most of our time near Curlew Lake, including walking over the recently decked trestle (seen to the left and in the featured photo). Next up was a warm and wonderful visit with good friends Judy and Larry, who live in the small town of Colville, the county seat of Stevens County. 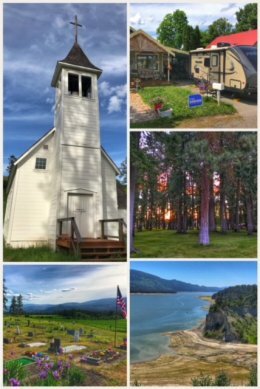 Colville is a neat little town, and Judy and Larry took us all over — showing us some wonderful sights, including Pia Mission, St. Paul’s Mission, Kettle Falls Historical Center, Douglas Falls, Crystal Falls, and China Bend Winery. We were also lucky to have dinners with lots of new and mutual friends, as we are indebted to them for being so gracious for allowing us to park our trailer in their driveway. 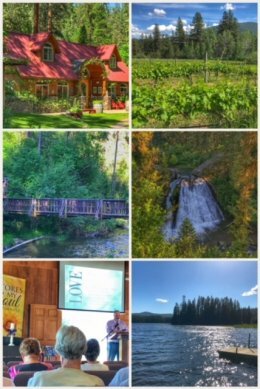 Two specific highlights of the Colville stop were a visits across the river to China Bend Winery and a church service with friend and pastor Shane Moffitt at Garden Valley Community Church. China Bend is an organic winery that produces wines with no sulfites, no additives, and no GMOs of any kind. It is located in “Kettle Falls,” though much closer to Northport, Washington. We went there for their barrel-tasting event and had a wonderful time. The winery also has a cute little bed & breakfast… and if you really love wine, you can also buy the winery. Finally, we had to experience another deep and meaningful sermon delivered by Pastor Shane, a deeply passionate and wonderfully friendly man. His message was all about love: Love is not jealous. (1 Corinthians 13:4). But this trip was more than just about seeing friends or enjoying nature or celebrating God’s love… no, this trip was also about investigating Spokane and the surrounding area for becoming the future homebase. Spokane has many of the things on our list we are seeking in a new home… but more importantly, there are numerous communities not far outside of Spokane that offer services while still having parcels 20-30+ acres in size. 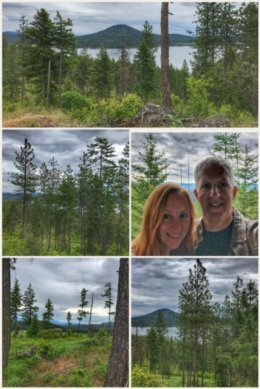 Happily, we discovered one nearly perfect parcel in the tiny community of Loon Lake… a nicely treed and hilly property of 30 acres we hope to purchase — for the future. Have no fear that this cross-country adventure will continue until we have been to all the national parks in the lower 48! Time will tell if this area is our new headquarters. 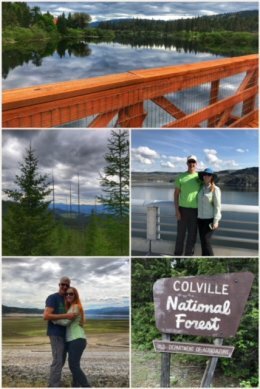 By the way, the Colville National Forest has more than 1.1 million acres across several towns and counties. Lake Roosevelt, as you may recall from a previous blog post, is a 130-mile long lake caused by the damming of the Columbia River, ranging from the Grand Coulee to Northport. But guess what’s next? We take a little diversion from our pursuit of U.S. national parks to head up to Canada and see a few of Canada’s national parks, including the widely photographed Banff National Park. Previous Post:Stop 30: North Cascades National Park… and More!